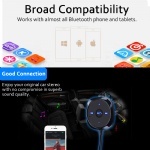 Widely Compatible: Universal Bluetooth technology,up to 33 ft range; Stream music from any Bluetooth capable device: Android smartphone, iPhone 7,Samsung Galaxy, Tablets, and other media players; Supports Bluetooth profiles: HFP, HSP, A2DP & AVRCP. 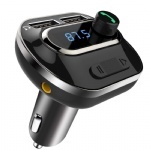 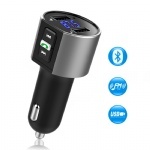 Simple Setup: Easy to connect your smartphone with your car stereo - just simply plug it into your car's auxiliary input jack and pair with your phone via Bluetooth; Automatically power on and connect to the last paired device. 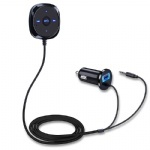 Hands-free: Provide a simple hands-free solution for answering and receiving phone calls from your Bluetooth-enabled phones while on the go; Seamlessly switches between incoming calls and music. 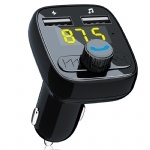 Wireless music player controls: Play, Pause, Previous song, Next song, Volume down, Volume up; Talking controls: answer and reject calls, previous call and Siri activated are available. 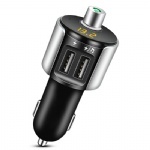 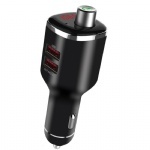 USB car charger: The cigarette lighter power adapter comes with 5V/2.1A USB charging port, able to charge additional device conveniently at the same time. 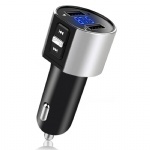 This item can only be used in cars with an Auxiliary Port (AUX).